An Unexpected Honour | what if? <What if… we had wings? Meredith, I would like to thank you for nominating us for the award of Most Influential Blogger. It really encourages me and gives me happiness. The award goes also to my fellow artists Cathy van Eck, David Stalling and Anthony Kelly, who keep my spirits up and support me in every way. In the course of the summer I plan to introduce you to them and their work. Please, stay with me for that. Everybody, you might want to visit Meredith’ blog. She shares her thoughts on various topics, such as her writing journeys, her family, dogs, spiritual script and even mouthwatering recipes. “Writings from her heart”, as she says herself. 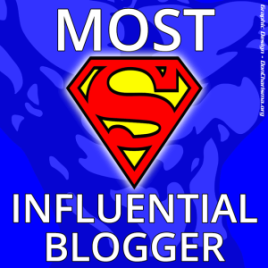 It is now my honour to recommend fellow bloggers for the Most Influential Blogger Award. I would like to appoint people who have already inspired me in the course of this project. Some of them are very experienced bloggers, some are still quite at the beginning. Like we are. Some of them have visited our blog, others have probably never heard of us. I will start with two bloggers, whose blogs I both really like, although they couldn’t be more different in their way of writing. 2. I am always entertained when I visit the blog; A Buick in the Land of Lexus, thank you Samara. For someone who loves math, I don’t add up. I’m a cool nerd. A feminine tomboy. Tough but fragile. Wild and domestic. Good mother but bad girl. Educated but still a project girl. An urbanite stuck in the suburbs. Soon, in posts to come, I will introduce you to eight more bloggers who I think have earned the “Most Influential Blogger”-award. Here are the guidelines for acceptance – very straightforward. Thank you so much for the nomination! I am so grateful you thought of me for this!